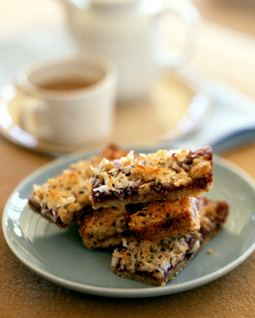 Oatmeal Coconut Raspberry Bars - A recipe from Savor California, the online showcase for extraordinary gourmet foods and beverages from California. Photo by Lisa Hubbard Photography. Spread 3/4 cup coconut evenly on a baking sheet and toast in middle of oven, stirring once, until golden, about 8 minutes, then cool. Blend together flour, sugars, and salt in a food processor, then add butter and blend until a dough begins to form. Transfer to a bowl and knead in oats and toasted coconut until combined well. Reserve 3/4 cup dough, then press remainder evenly into bottom of a buttered 13- by 9-inch metal baking pan and spread jam over it. Loosen from sides of pan with a sharp knife, then lift out in 1 piece and transfer to a cutting board. Bars can be made 3 days ahead and kept in an airtight container at room temperature.